England staged a superb recovery to earn a consolation two-wicket win over India in the third women's one-day international in Mumbai. 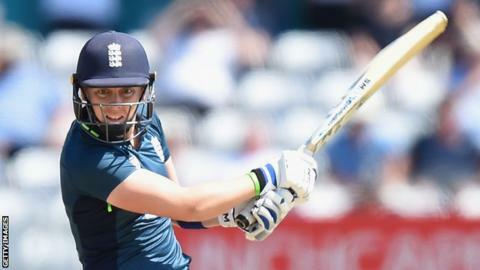 Chasing 206, the tourists slumped to 49-5 before they were revived by Heather Knight (47) and a maiden ODI half-century from Danielle Wyatt (56). Katherine Brunt fell with two required, but Anya Shrubsole hit her first ball for four to seal victory. India were earlier 129-1 before Brunt's 5-28 helped restrict them to 205-8. The home side still take the series 2-1, but England have avoided what would have been only their second whitewash in India. More importantly, they earn two points in the International Cricket Council's Women's Championship, climbing to fifth in the table, which would be good enough to qualify for the 2021 World Cup if hosts New Zealand finish in the top four. England now move on to Guwahati for three Twenty20 internationals against India, the first of which is on Monday. Wyatt, dropped for the second match, was only recalled after an injury to left-arm spinner Sophie Ecclestone. She joined Knight at the crease at the fall of England's fifth wicket, after India new-ball pair Jhulan Goswami and Shikha Pandey had once again been responsible for a destruction of the top order. Aggressive when opening in T20 cricket, Wyatt frustrated Knight by being caught in the deep with the first match of the series in the balance, but here controlled her instincts to successfully support the captain in a stand of 69. Knight accumulated without trouble, but when she edged the leg-spin of Poonam Yadav behind with 88 runs still required, England's hopes seemed to depart with her. Wyatt, though, continued to show restraint, finding a willing ally in Georgia Elwiss. They added 56 before Wyatt could resist no longer and was caught at long-on off Pandey. Elwiss (33 not out) and Brunt edged England closer and, even though Brunt pulled Yadav to Punam Raut, Shrubsole's pull for four silenced the partisan crowd. After winning the toss, India looked to be taking full advantage of a fresh surface after Jemimah Rodrigues played on off Brunt in the first over. Smriti Mandhana made 66 and Raut 56 in a second-wicket stand of 129, Mandhana particularly dominant when England's change bowlers dropped short. With England in desperate need for a breakthrough, they returned to Brunt, who immediately persuaded to Mandhana to hole out to square leg before bowling Raut. Mithali Raj was caught off a bat-pad, Mona Meshram lbw and, at the other end, Shrubsole swung the ball to bowl Taniya Bhatia. In all, the India collapse was six wickets for 21 runs. Deepti Sharma remained and stalled England's progress in the company of Pandey, carefully adding 47 for the eighth wicket. As runs came more freely at the end and with England not totalling more than 161 in the first two games, India seemed favourites. Indeed, they were winning this game until Knight, Wyatt and Elwiss intervened. Player of the match Katherine Brunt told BBC Sport: "It's been a massive amount of learning and we're delighted to end on a high. "There's plenty of room for improvement. I think some of us will be disappointed with some decisions, lapses in judgement, execution, things like that. "You can't fault the effort, we are working very hard, trying almost too hard. There is a lot more to come, we're in a good place and we're excited for what comes next." England coach Mark Robinson told BBC Sport: "It's bittersweet, because the dream was to be the first England team to win in India. We haven't done that and we have to take it on the chin. "We weren't at all worried about the Women's Championship. You play the game that you are in, rather than looking too far ahead. "It has been challenging to come out of an indoor school and play on these wickets. We had only one warm-up game. We have to find a way to have a better lead-up to the first game of a tour."